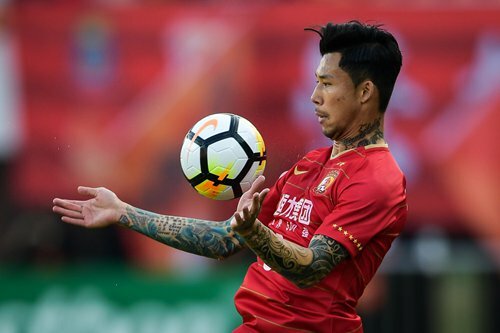 A Chinese music festival has reportedly banned artists from showing their tattoos on stage, after players on the Chinese national soccer team covered their tattoos during games last month. In January, a Chinese media watchdog banned tattoos and several other subculture elements from being shown in broadcasts, a move that triggered heated discussions. "For most Chinese people, tattoos are related to 'bad guys,'" Zhu Wei, a communication and law analyst said. Showing tattoos in public is not just a personal choice, but involves other people's feelings, he noted. A screenshot reported to be from a WeChat group recently spread online showing that tattoos will be banned on the stage of the Hangzhou Strawberry Music Festival, scheduled to open on April 15 in East China's Zhejiang Province. "New instructions received from the Hangzhou Strawberry Music Festival, tattoos should not be shown… Wear long-sleeves instead," the chat record read, according to chinatimes.com. "For some artists with tattoos on their neck or hands, please think about how to cover them… use stickers or hoods, or even gauze," it read. "I am not clear about the situation," an employee in charge of media promotion from Beijing-based Modern Sky, organizer of the Strawberry Music Festival, told the Global Times on April 2. A dancer at the festival reached by the Global Times also said that she was not aware of the notice. "In the future, performers that we watch on stage will be like assassins from ancient times, with bamboo hats, masks and long gowns," a Sina Weibo user said. The Strawberry Music Festival, founded in 1997, is one of China's most influential music festivals. After Hangzhou, the festival is scheduled to be held in Shanghai and Beijing late in 2018. The posts reportedly banning tattoos at the Strawberry Music Festival came two weeks after the Chinese Football Association allegedly said no tattoos should be shown during games. Players were seen to have covered their tattoos with tape during games China's U23 national team played with Syria and Wales last month, news website thepaper.cn reported. However, the cover-up didn't do much to help the Chinese team, who lost to Wales 6-0. "I dislike any form of dyed hair or tattoos," Jia Xiuquan, head coach of China's U19 team, was quoted by thepaper.cn as saying. "Players should focus on the game rather than their image or appearance." Artists who have tattoos, or display elements of hip-hop culture, subculture or decadence are not allowed on TV, Shanxi Evening News reported in January, citing Gao Changli, director of the publicity department of the State Administration of Press, Publication, Radio Film and Television. Chinese singer Dou Jingtong was seen to have covered up her jaw-to-neck tattoo on a TV show in 2017. In 2017, video-sharing app Kuaishou also announced it was banning users from showing tattoos. "My Dad started a cold war with me when he finally saw my tattoo," Xiao Liu (pseudonym), 22, from North China's Hebei Province, told the Global Times. Xiao Liu got tattoo of a crown on his arm when he was in junior high school. The tattoo could be covered up with a T-shirt, so it was only recently that his parents discovered it, prompting a furious reaction from them. "I cannot see why tattoos should be banned," he said. When most people see tattoos, the first impression they get is one of danger, as people with tattoos are usually considered 'bad guys' in society, Zhu Wei, a professor from the China University of Political Science and Law, told the Global Times. Zhu indicated that in ancient China, tattoos were used to mark criminals in prison. China is not the first country to have banned tattoos in public. In Japan, people with tattoos are not allowed to enter public hot springs, according to Zhu. "Celebrities and public figures with tattoos who appear on TV very likely set bad examples for young generations," he said.